This product guide provides essential pre-sales information to understand the structure of the System x3550 M5 offering, its key features and specifications, components and options, and configuration guidelines. This guide is intended for technical specialists, sales specialists, sales engineers, IT architects, and other IT professionals who want to learn more about the System x3550 M5 and consider its use in IT solutions. This Product Guide describes withdrawn models of the Lenovo System x3550 M5 (Machine Type 8869) with the Intel Xeon processor E5-2600 v4 and E5-2600 v3 product families. For withdrawn models of the Lenovo System x3550 M5 (Machine Type 5463) with the Intel Xeon processor E5-2600 v3 product family, see the following Product Guide: Lenovo System x3550 M5 (Machine Type 5463). The System x3550 M5 (8869) server models described in this product guide are withdrawn and no longer available for ordering. Designed in a compact, versatile 1U two-socket rack server, the Lenovo System x3550 M5 (E5-2600 v4) server (Machine Type 8869) fuels almost any workload in the software-defined data center from infrastructure to high-performance computing (HPC) to cloud or big data with leadership security, efficiency, and reliability features. With support for Intel Xeon processor E5-2600 v4 product family and faster, energy-efficient TruDDR4 memory, the System x3550 M5 delivers exceptional performance. Flexible and scalable internal storage configurations include up to 12x 2.5-inch or 4x 3.5-inch drives with a wide selection of drive sizes and types. The System x3550 M5 incorporates energy smart features for minimized costs and efficient performance. Dual fan zones support operation in up to 40°C environments. 80 PLUS Titanium power supply units (PSUs) can deliver 96% efficiency at 50% load. The System x3550 M5 has outstanding memory performance that is achieved by supporting two-RDIMM-per-channel configurations at speeds up to 12% faster than the Intel specification, while still maintaining world-class reliability. The System x3550 M5 integrates leadership security and reliability. System x Trusted Platform Assurance, an exclusive set of System x features and practices, establishes a solid security foundation for your workloads. Enterprise-class data protection is provided with optional self-encrypting drives, and advanced diagnostic tools facilitate reduced downtime and costs. The System x3550 M5 is a cost- and density-balanced 1U, dual-socket business-critical server, offering improved performance and pay-as-you grow flexibility along with new features that improve server management capability. New, innovative, energy-smart design with powerful high-performance processors, a large capacity of high-performing DDR4 memory, and an improved feature set are ideal for business-critical applications and cloud deployments. Improves productivity by offering superior system performance with the Intel Xeon processor E5-2600 v4 product family with up to 22-core processors, up to 55 MB of cache, up to 2400 MHz memory speeds, and up to 9.6 GT/s QPI interconnect links. Support for up to two processors, 44 cores, and 88 threads allows to maximize the concurrent execution of multithreaded applications. Note: Also available via CTO is the Intel Xeon processor E5-2600 v3 product family with up to 14-core processors, up to 35 MB of cache, up to 2133 MHz memory speeds, and up to 9.6 GT/s QPI interconnect links. Up to 2400 MHz memory speeds with two DIMMs per channel running at 2400 MHz to help maximize system performance. Flexible and scalable internal storage configurations provide up to 92 TB of storage capacity with 7.68 TB 2.5-inch solid-state drives (SSDs) in a 1U rack form factor. With Intel Integrated I/O Technology, the PCI Express 3.0 controller is integrated into the Intel Xeon processor E5-2600 v4 product family. This helps to dramatically reduce I/O latency and increase overall system performance. Low-voltage 1.2 V DDR4 memory DIMMs offer energy savings compared to 1.35 V and 1.5 V DDR3 DIMMs. Lenovo XClarity Energy Manager provide advanced data center power notification, analysis, and policy-based management to help achieve lower heat output and reduced cooling needs. The following figure shows the front of the System x3550 M5 server with up to eight 2.5-inch drive bays and the Front IO cage Entry (default). 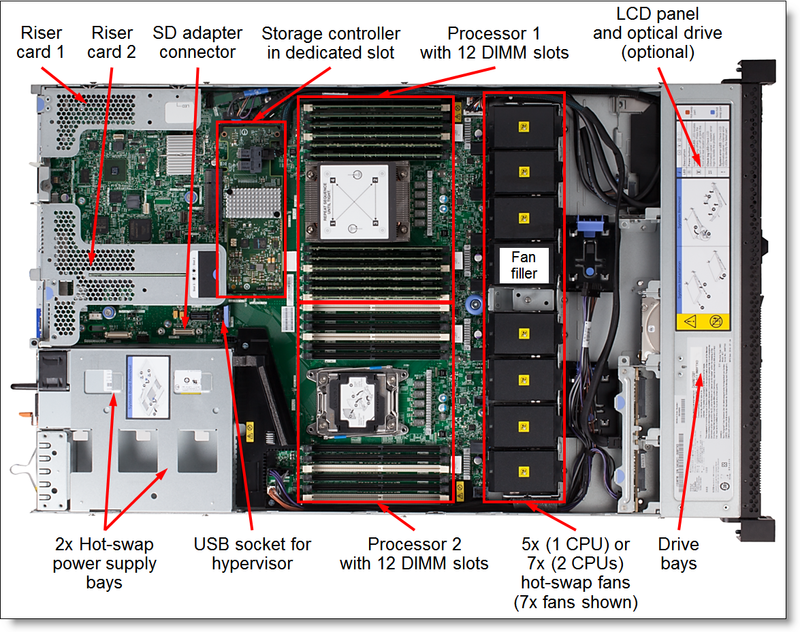 The following figure shows the front of the System x3550 M5 server with up to eight 2.5-inch drive bays and the Front IO cage Standard (optional). The following figure shows the front of the System x3550 M5 server with up to eight 2.5-inch drive bays and the Front IO cage Advanced (optional). The following figure shows the front of the System x3550 M5 server with ten 2.5-inch drive bays. The following figure shows the front of the System x3550 M5 server with eight 2.5-inch SAS/SATA and two 2.5-inch PCIe drive bays. The following figure shows the front of the System x3550 M5 server with four 3.5-inch drive bays. The following figure shows the rear of the System x3550 M5 server with three PCIe low profile slots. Memory protection Error correction code (ECC), Chipkill (for x4-based memory DIMMs), memory mirroring, and memory rank sparing. 12 Gb SAS/6 Gb SATA RAID: RAID 0, 1, 10 with M1215 or M5210. Optional upgrade to RAID 5, 50 is available for M1215. Optional upgrade to RAID 5, 50 is available for M5210 (zero-cache; 1 GB non-backed cache; 1 GB, 2 GB, or 4 GB flash-backed cache). Optional upgrade to RAID 6, 60 is available for M5210 (requires a cache upgrade). Optional SSD Caching and Performance Accelerator upgrades are available for M5210. Tape drive bays None. Support for an external backup unit. 4x 3.5" and 10x 2.5" drive bay models: 3x USB 2.0 and 1x DB-15 video ports. 8x 2.5" drive bay models: 1x USB 2.0 (standard); or 2x USB 2.0 and 1x VGA ports (optional). Rear: 2x USB 3.0 and 1x VGA ports. Optional 1x DB-9 serial port. Cooling Calibrated Vectored Cooling with up to seven redundant hot-swap system fans (five fans standard, two additional fans with the second processor or with the optional fan kit for models with one processor and with select adapters used); dual fan zones with N+1 fan redundancy; each fan has two motors. Power supply Up to two redundant hot-swap 550 W, 750 W, or 900 W (100-240V), or 1500 W (200-240V) High Efficiency Platinum AC power supplies, or 750 W (200-240V) High Efficiency Titanium AC power supplies, or 900 W High Efficiency -48 V DC power supplies. Systems management Unified Extensible Firmware Interface (UEFI), Integrated Management Module II (IMM2.1) based on Renesas SH7758, Predictive Failure Analysis, light path diagnostics, Automatic Server Restart, ToolsCenter, XClarity Administrator, and XClarity Energy Manager. Optional IMM2.1 Advanced Upgrade for remote presence (graphics, keyboard and mouse, virtual media). Security features Power-on password, administrator's password, Trusted Platform Module (TPM) 1.2 or 2.0 (configurable UEFI setting). Optional lockable front bezel. Operating systems Microsoft Windows Server 2008 R2, 2012, 2012 R2, 2016, and 2019; Red Hat Enterprise Linux 6 (x64) and 7; SUSE Linux Enterprise Server 11 (x64) and 12; VMware vSphere (ESXi) 5.5, 6.0, 6.5, and 6.7. Warranty Three-year customer-replaceable unit and onsite limited warranty with 9x5/Next Business Day. Service and support Optional service upgrades are available through the Lenovo Services: 4-hour or 2-hour response time, 6 hours fix time, one-year or two-year warranty extension, software support for System x hardware and selected System x and third-party (Microsoft, Linux, VMware) software. The following table lists the standard models of the System x3550 M5. Note: Standard models of the x3550 M5 (E5-2600 v4) are not available in North America. * x in the Model number represents a country-specific letter (for example, the EMEA model number is 8869A2G). Ask a Lenovo representative for specifics. ** Processor detail: Processor quantity and model, cores, core speed, cache, memory speed, and thermal design power (TDP). # Unless otherwise specified in a footnote, the DIMMs installed are x4 RDIMMs. § Unless otherwise specified in a footnote, the power supplies are 80 PLUS Platinum certified. † An optional optical drive requires the front IO cage Standard (00MV367) or Advanced (00MV368). ‡ An optional LCD panel is included in the optional front IO cage Advanced (00MV368). *** Titanium power supply; supports 200-240 V AC only. ^ Two I/O slots standard: The onboard PCIe 3.0 x8 slot 4 and low profile PCIe 3.0 x16 slot 1 on the Riser Card 1 (feature code A5AG). Cable Management Arm (CMA) is not included; see Rack installation for ordering information. Power cables are not included; see Power supplies and cables for ordering information. The following table lists the TopSeller models of the System x3550 M5. Note: TopSeller models are country-specific; that is, each country may define their own server models, and not all server models are available in every country. * Processor detail: Processor quantity and model, cores, core speed, cache, memory speed, and thermal design power (TDP). § The power supplies are 80 PLUS Platinum certified. ** The model ships with the SD Media Adapter (feature code A5TJ) installed and 1U cable management arm (feature code A5AL) included. Note: Cable Management Arm (CMA) is not included (see table footnotes for exceptions, if any); see Rack installation for ordering information. The System x3550 M5 supports up to two processors of the Intel Xeon processor E5-2600 v4 product family. Also, support for the Intel Xeon processor E5-2600 v3 product family is available via CTO only. The following tables list the specifications of the processors for the System x3550 M5. For System x3550 M5 server models that come standard with one processor, the second processor can be ordered, if required (see the following table for ordering information). The second processor must be of the same model as the first processor. The second processor option includes two system fans. The System x3550 M5 supports TruDDR4 memory. TruDDR4 memory uses the highest-quality components sourced from Tier 1 DRAM suppliers and only memory that meets strict requirements is selected. It is compatibility tested and tuned on every System x server to maximize performance and reliability. TruDDR4 memory has a unique signature programmed into the DIMM, which enables System x servers to verify whether the memory installed is qualified and supported. Because TruDDR4 memory is authenticated, certain extended memory performance features can be enabled to extend performance over industry standards. From a service and support standpoint, System x memory automatically assumes the system's warranty, and service and support provided worldwide. Memory speed for selected quantity of DIMMs per channel. System x engineering tested and validated system designs that support memory speeds beyond Intel memory specifications, which provides benefits for workloads that require memory speed and density. System x TruDDR4 memory is fully supported up to the speeds that are shown in the following tables. Table cells highlighted with a gray background indicate when the DIMMs are allowed to operate at a higher speed than Intel specifications define. * Maximum memory capacity is achieved with two processors installed. With one processor, the maximum memory capacity is a half of what is shown. The following table lists memory options available for the System x3550 M5 server. * One processor / two processors. ** Not supported with the Intel Xeon processor E5-2600 v3 product family. The following figure shows the SAS/SATA drive bay configurations. The following figure shows the SAS/SATA and PCIe drive bay configurations. 4x 3.5-inch drive bay models of the System x3550 M5 have one optical drive bay. For models with up to 8x 2.5-inch drive bays, the optional Front IO cage Standard or Advanced provides one optical drive bay, 2x USB 2.0 ports, and 1x DB-15 video port. In addition, the Front IO cage Advanced option includes a light path LCD panel. The Front IO cage Standard and Advanced options are listed in the following table. The following table shows the internal storage options available for the System x3550 M5 server. # PCIe Extender occupies a PCIe slot and is included in the NVMe PCIe SSD Upgrade Kit. ** Requires the selection of a PCIe riser card 2. If 145 W processors (E5-2697 v4 and E5-2699 v4) are selected, the ambient temperature cannot exceed 35 °C (95 °F). The HDD Rear Kit (00KA058) is supported only for models with 10x 2.5-inch drive bays; the HDD Rear Kit is connected to the SAS expander on the 10-drive backplane. The HDD Rear Kit is installed in place of the PCIe slots 1 and 2 (see I/O expansion), and it includes a special riser that provides PCIe 3.0 x16 slot 3. No other riser cards can be used with the HDD Rear Kit. The HDD Rear Kit is not supported in the configurations with NVMe PCIe SSDs. The following table lists the storage controllers and the additional options used for the internal storage of the System x3550 M5 server. The internal storage controllers are installed into a dedicated PCIe slot 4. ** One FoD upgrade enables the feature on all ServeRAID M5200 Series adapters (M5210, M5225) installed in the server. *** One FoD upgrade enables the feature on all ServeRAID M1200 Series adapters (M1215) installed in the server. The following table summarizes features of supported storage controllers. The following table lists supported combinations of the storage controllers and drive types for the System x3550 M5 drive bay configurations. # Rear drives are connected to the SAS expander on the 10-drive backplane (supported only for 10x 2.5" front drive bay models). The following tables list currently available drive options for internal storage of the System x3550 M5 server. * Not supported with the Intel Xeon processor E5-2600 v3 product family. ** The NVMe PCIe SSDs are non-hot-swap when used in the System x3550 M5. The System x3550 M5 server supports the optical drive options listed in the following table. Server models with 10x 2.5-inch drive bays on the front do not support an internal optical drive; a supported external optical drive can be used instead. Server models with up to 8x 2.5-inch drive bays require the Front IO cage Standard (00MV367) or Advanced (00MV368) for optical drive support. The System x3550 M5 server supports up to four PCIe slots: one on the system planar that is dedicated for an internal storage controller and up to three with different riser cards installed into two riser sockets on the system planar (one riser socket supports the installation of one riser card). All standard models have one riser card (Riser 1) installed, which provides one low profile PCIe x16 Gen 3 slot (riser option part number 00KA061). You can replace or add riser cards with the riser card options that are listed in the following table (or configure these riser cards to be factory-integrated using CTO). If the FHHL x8 or x16 Riser 2 options (feature codes A5AD and A5AE) are selected, the Mellanox ConnectX-3 Pro ML2 2x40GbE/FDR VPI Adapter (part number 00FP650) cannot be used. The HDD Rear Kit (00KA058; see Internal storage) is installed in place of the PCIe slots 1 and 2; it includes a special riser that provides PCIe 3.0 x16 slot 3, and no other riser cards can be used. The COM Port Bracket listed in the following table is used for mounting the external DB-9 serial port on the rear of the System x3550 M5. This option includes the bracket and the cable. The COM Port option is mounted in place of the PCIe slot 3, and only PCIe slots 1 and 2 remain available. Optionally, the System x3550 M5 server supports ML2 adapters that are installed in the custom ML2 slot provided by the PCIe ML2 riser card (part number 00KA063). This slot supports adapters with either two or four 10 Gb ports or four Gigabit ports and supports direct connectivity to the IMM2.1 service processor for out-of-band systems management. ‡ Not supported with the Intel Xeon processor E5-2600 v3 product family. ^ Supported only in the full-height PCIe slot 2 supplied by one of the full-height PCIe riser cards (feature A5AD or A5AE). If the Intel X540 ML2 Dual Port 10GbaseT Adapter (00D1994) is used, the additional system fans might be required (see Cooling for details). ML2 network adapters are supported in the ML2 slot 1 supplied by the ML2 Riser Card (part number 00KA063). PCIe x16 Low Profile network adapters are supported in the full-height PCIe x16 slots supplied by the riser cards 1 and 2 (Note: Omni-Path adapters are not supported in the PCIe slot 1). PCIe x4 and x8 Low Profile network adapters are supported in the low profile and full-height PCIe x8 and x16 slots supplied by the riser cards 1 and 2. PCIe x8 full-height network adapters are supported in the full-height PCIe x8 or x16 slot supplied by the riser card 2. Some adapters require supported transceivers or DAC cables to be purchased for the adapter. For 1 GbE RJ-45 adapters, UTP Category 5e or 6 cables can be ordered from Lenovo. For 10 GbE RJ-45 adapters, UTP Category 6 cables can be ordered from Lenovo. The maximum number of transceivers or cables that are supported per adapter equals the quantity of the adapter ports, and all adapter ports must have the same type of the transceiver or cable selected. The following table lists UTP cables for the 10 GbE and 1 GbE RJ-45 adapters. The following table lists transceivers and cables for the 40 GbE QSFP+ adapters. The following table lists cables for the Mellanox FDR InfiniBand QSFP adapters. The following table lists transceivers and cables for the 100 GbE QSFP28 network adapters. The following table lists cables for the Mellanox EDR InfiniBand QSFP28 adapters. * The Mellanox ConnectX-4 2x100GbE/EDR IB QSFP28 VPI Adapter (00MM960) supports only a subset of the EDR InfiniBand cables listed in the table: 00MP516, 00MP524, 00MP536, and 00MP544. The following table lists cables for the Intel Omni-Path QSFP28 adapters. The following table lists SAS RAID controllers and HBAs for external storage attachments that are supported by the System x3550 M5 server. * One FoD upgrade for the M5225 activates the feature on all M5200 series controllers (M5210, M5225) installed in a server. Note: SAS RAID controllers and HBAs for external storage are supported in low profile and full-high PCIe x8 and x16 slots supplied by the riser cards 1 and 2. The following table lists Fibre Channel HBAs supported by the System x3550 M5 server. The System x3550 M5 server supports the Flash storage adapters listed in the following table. ** Supported only in the PCIe slot 2 and requires the FHHL x16 Riser Card 2 (feature code A5AD) and the second processor or the FHHL x8 Riser Card 2 (feature code A5AE). The Flash Adapters might require the use of the additional system fans (see Cooling for details). Low profile Flash Adapters are supported in low profile and half-high slots; full-high Flash Adapters are supported only in the PCIe slot 2 and require the FHHL x8 or x16 Riser Card 2 (feature code A5AE or A5AD, respectively); FHHL x16 Riser requires the second processor. The io3 Flash Adapters cannot be factory installed; they are supported as field-installable options only. The server cannot be shipped with these adapters installed. The System x3550 M5 server supports graphics processing units (GPUs) listed in the following table. The FHHL x16 PCIe Riser 2 (feature code A5AD) and the second processor are required. The System x3550 M5 server supports up to seven system fans that provide dual fan zones cooling with N+1 fan redundancy, and each system fan has two motors. The following table lists the additional system fan option for the System x3550 M5. The option contains two additional fans. The System x3550 M5 server supports up to two redundant power supplies, and is capable of N+N redundancy depending on the configuration. Standard models come with one power supply. The following table lists the power supplies. The System x3550 M5 servers ship with or without a power cord (model dependent). The 900 W AC power supply option ships with one 2.8m, 13A/125V-10A/250V, IEC 320-C13 to C14 rack power cable (feature code 6400), and the other hot-swap AC power supply options ship with one 2.8m, 10A/100-250V, IEC 320-C13 to C14 rack power cable (feature code 6311). Country-specific line cords and rack power cables can be ordered, if needed (see the following table). * Available via Configure to Order (CTO). Configuration note: If the 900 W AC power supplies (00KA098) in the System x3550 M5 server are connected to a low-voltage power source (100 - 125 V), the only supported power cables are those that are rated above 10A; cables that are rated at 10A are not supported. The System x3550 M5 server supports VMware ESXi installed on a USB memory key or one or two SD cards in the SD Media Adapter. The USB memory key is installed in a USB socket inside the server. The SD Media Adapter is installed in a dedicated slot inside the server. When only one SD card is installed in the SD Media Adapter, you can create up to 16 volumes, each of which is presented to UEFI as a bootable device. When two SD Media cards are inserted, volumes can be mirrored (RAID 1) across both cards, up to a total of eight mirrored volumes. The RAID functionality is handled internally by the SD Media Adapter. * Option 00ML706 includes two 32 GB SD cards; however, for CTO orders, feature code A5TJ does not include SD media and the 32 GB cards and VMware vSphere preload must be selected separately. The System x3550 M5 server contains Integrated Management Module II (IMM2.1), which provides advanced service-processor control, monitoring, and an alerting function. If an environmental condition exceeds a threshold or if a system component fails, the IMM2.1 lights LEDs to help you diagnose the problem, records the error in the event log, and alerts you to the problem. Optionally, the IMM2.1 also provides a virtual presence capability for remote server management capabilities. The blue-screen capture feature captures the video display contents before the IMM2.1 restarts the server when the IMM2.1 detects an operating system hang condition. A system administrator can use the blue-screen capture to assist in determining the cause of the hang condition. All System x3550 M5 server models include basic light path diagnostics, which provides the system LEDs on the front of the server (see Components and connectors) and the LEDs near the monitored components (for example, the DIMM error LED on the system board). Models with 4x or 8x 2.5-inch drive bays support an optional next-gen light path LCD display panel. The LCD display enables you to have quick access to system status, firmware, network, and health information. Models with 4x 3.5-inch or 10x 2.5-inch front drive bays do not support an LCD display panel. The LCD panel can be configured via CTO or is included in the Front IO cage Advanced (see the following table). * The option part number for the front IO cage Advanced (00MV368) includes the LCD display. ** If configured via CTO, the LCD display (feature code ATYV) is NOT included in the front IO cage Advanced (feature code ATLK); both front IO cage Advanced (feature code ATLK) and LCD display (feature code ATYV) must be selected. The following table lists the security options that are available for the System x3550 M5 server. The following table lists the rack installation options that are available for the System x3550 M5 server. * The System x CMA requires the Slide Kit G4 (00KA606) or Universal Slides Kit (00KA500). The Custom Rail Kit (00MW239) is not supported with the CMA. Note: The System x3550 M5 Slide Kit G4 (00KA606) is included with the models that are listed in Standard models and TopSeller models.